Sometimes you have to break the rules before the rules break you. I love living in the future! To have the privilege of participating in the funding of a book to really get behind books I want to see in print, to demonstrate with my frugal spending what I really want to read. I am proudly one of those who backed the Pozible campaign that was responsible for funding this book. What an extraordinary time in publishing, to be a reader and hooked into communities and networks! I funded at the level where I received a gorgeous hardcover book, and I have to compliment Kathleen Jennings on her gorgeous cover and internal illustrations. From first glance at the cover you can see what this book is about, what kind of stories about ladies it tells, and it whets your appetite marvellously. Historical fiction is one of those things I dabble in, historical non-fiction I just haven’t done remotely enough reading of. But there was no way I could resist an anthology like this that highlights the interesting lives of historical women, imagining how they lived, what they thought and looking at the impact they made – not always for the greater good. And that too is a strength of this anthology, it features all kinds of cranky ladies, from those who seek to improve the moral good, to those who are remembered with horror and fear, daring women, wronged women, women I’ve heard of and those who are brand new to me. This book is both a pleasure to read, and gives you some small insight into the historical significance of several women, mostly those who are forgotten by modern history. It’s not that the book is educational exactly, but it does make you want to learn more, to study these women and their lives. A woman who is determined not to submit to any man unless he can best her in wrestling, and because she is so fierce and talented, she wins thousands of horses from them as they fail to beat her. I love Khutulun’s fierce spirit and that she is herself and doesn’t have to hide from her father, that he supports her even if he is surprised by her declarations and strength of character. It’s these two things, her strength and his love that really resonated for me in this story. I love the writing tone of this story, it plays in my mind almost as though I’m watching an episode of period drama like ‘Call the Midwife’ or ‘Downton Abbey’ or similar. I love Lilian’s dedication to medicine and care, and reading about the early use of cars in Brisbane was really interesting – particularly including the Royal Automobile Club. I loved in particular her discovery about the water treatment for burns. The whole story was just gorgeous, I’d read a whole novel about Lilian, absolutely. What a gorgeous story of piety, commitment and activism. Sister Hildegard has such quiet strength and Marillier’s writing truly brings her to life. I love the quiet opposition, the use of letters and negotiation with logic that Sister Hildegard uses. I love that although she has visions that the story isn’t really centred around them but about her own perseverance in developing her virtues. Trying to better oneself, trying to better the world around you. Such a beautiful story. The storytelling voice in this story is unique, it’s different and I found that unlike most of the other stories which I read in a single sitting, this one I savoured over several sittings because each word and sentence seemed to be so layered. I loved the character of the Dragon, that she was so ruthless and yet operated within her own rules. I love that she had family, children and that this clearly didn’t stop her being both terrifying and powerful. This was one of the stand out stories in the anthology for me. Another favourite from the anthology, Nix’s story captivated me. I love the mythology behind this story and that Lady Godiva was a saviour in partnership with the bees. I loved the way the story was centred around women’s business in tending the bees, that became the saving of everyone else. This was a perfect short story for me – completely self contained, gave me every satisfaction and left me content. Queerness and silk discovery, choosing love over a certain kind of elevation into prosperity/wealth/power. This story was sweetness, it was delightful, and I loved that Leizu got to be with her lady love and that nothing tragic happened. Maybe it was different in history, but I’m in love with this story where the story ends on such a perfect note. Strength and determination, proving one self to be just as good as the men who never had to question why they didn’t get to be the best and brightest. Earning the approval of one’s father. Trying to hold out against invasion, this story has everything – as I read the words, it seemed like an action movie was playing in my head! Nora reminds me of every young heroine I’ve read and loved, through this story and seeing her grow into a powerful young woman who seeks to prove herself and be recognised for her strength is so satisfying. I love that she’s hungry for battle, a little bloodthirsty and is full of valour and courage. The way this story begins with death, with familiarity and the Grey Lady is so intriguing! I’m not very familiar with the story of both of the Marys, both Shelley and Wollstonecraft but I loved reading about them both through Wollstonecraft’s eyes. I’ve always enjoyed stories that explore companionship of a supernatural kind that is not really of the ‘real’ world, the Grey Lady is a mysterious but compelling such companion and I loved the unfolding of her relationship with Mary. So much to love about this story! I’m not a horror reader, it’s fair to say that I go out of my way to avoid it. So I can’t say that I liked or loved this story, but it did resonate with me strongly. 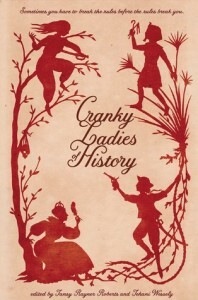 And I think it was so important to include this story in amongst the others in the book, stories of cranky ladies where their motives aren’t pure, they aren’t good people, because these women too are part of history, have been forgotten and their impacts largely unwritten and untold. A story of Countess Bathory, one of the most notorious serial killers in history, and especially as a female serial killer is a good example of this. Other than the fact that she murdered countless other women, what do we know of her life, her reasons, what really happened? Not much. Needless to say this story left me chilled and I needed a unicorn chaser (or three) after it. All in all, this anthology is *glorious*!